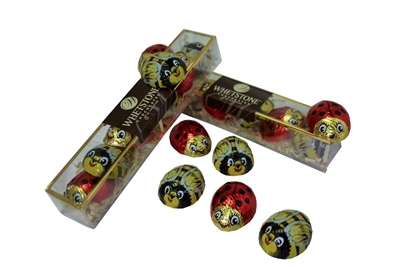 Lady Bugs & Bumble Bees Solid Milk Chocolate made with the finest premium milk chocolate, molded solid chocolate, foil wrapped cutest bumble bee & Lady Bug foils. Each bug contains 1/2 ounce solid chocolate which are absolutely delicious! They make perfect gifts for birthdays, anniversaries, weddings, candy favors, party favors, any special occasion!